Working purely off my intuition, I asked Irelynn to stay on Zorra’s back, and I asked Zorra if she could just hold on for long enough to show me why she so strongly wanted Irelynn to get off. As the three of us explored the deeper levels of what might be happening here, Irelynn began to notice some things. Zorra’s shoulders, right in front of Irelynn’s knees had puffed up; one side worse than the other. Her neck had gone rigid, and Irelynn perceived a line of ‘something wrong’ from the base of her left ear all the way back to her shoulder. Then Irelynn slid off and we asked Zorra if there was anything else. She seemed finished and wandered back to the hay. We both felt this was still that same old trauma of being ridden forcefully and painfully, coming up again, and obviously still locked into her physical body. So what happened after this session? If I just hand-walk Zorra on trails, she gets impatient, as she wants to go faster at certain spots and I simply cannot run as fast, or for as long as she wants. Even after 2 hours of hiking (interspersed with me running as fast as I can), I am exhausted, but she wants to go back on the trails and let’s do it again! When I insist I have to go home, she walks home at the speed of a depressed turtle, stopping and gazing back at the park the whole way home. 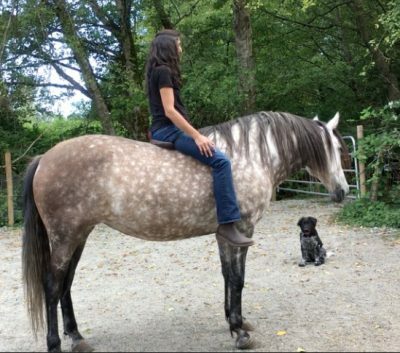 I had a horse once who’d been a trail horse for 15 years and man, that horse was completely DONE with riding (unless it was my 11-year-old daughter). So I do know what that looks/feels like and a horse in that state is pretty clear. So my path now with Zorra is to continue the healing of her emotional and physical body – to walk that journey together. The first thing I felt led to do after this session with Ainsley was to continue teaching her how to lift up her back to support a weight on her spine, rather than sinking and going swayback. I think of it as me carrying a heavy backpack, or hiking with one of my kids strapped to my chest or back. If you hollow your back (go swayback and stick your bum out) you will have killer back pain by the end of an hour or two of hiking – and you may be injured as a result. But if you tuck your pelvis, pull in your core muscles, and pull up from your cervical spine (at the base of your head) you can carry 10-20 percent of your body weight fairly easily. Hikers who train and condition can carry a lot more. Of course, the key here is that you want to carry your child, or you want to climb Mount Everest. That’s what differentiates a worthwhile adventure from an extended torture session! Personally, I do not enjoy riding around an arena – it feels super boring and repetitive to me. And I also don’t like working under an instructor as I find it greatly impairs my ability to connect with and listen to my horse, so using the techniques shown in this video are probably not going to work for me. But I will continue to feel my way along, using my 5-Minute Fun collaborative learning approach and see what Zorra and I come up with. If we hit on anything that works really well, or feels like it might be transferable, I’ll share it here! In the meantime, I’m going to teach all my horses that cue to raise their spine (the equivalent of me tucking my pelvis). I’ve also found (riding other horses) that if I push my tailbone forward, unhook my shoulders by rotating them backwards, tuck my chin and pull up on my cervical spine (base of my head up towards the sky), and take deep breaths while I’m on their back, they automatically lower their head and collect themselves to mimic what I’m doing. UPDATE: One year later, yet another piece of Zorra’s core trauma has come forward for healing. You can read the story of the next piece from the beginning here, or you can just tap along to this EFT video where I surrogate-tap for Zorra. Even if you never plan to ride your horse again, I encourage you to tap along and release this deep-seated trauma from their cells, tissues and consciousness. I have no idea if Zorra will ever want to be ridden again, but I know that doing this healing will only benefit our relationship. Likewise, if you run any kind of horse sanctuary – or visit one – it will be a tremendous gift to tap on behalf of all the horses there. Really enjoyed watching and learning from your video with Zorra and Ainsley. Very good!